Ever wonder how the make the forms for marine propellers? Now you have. It turns out they use a bunch of plywood, Bondo, and sandpaper. Awesome viewing for a coffee break. Finally a new way to hurt yourself! [Darrell]’s solder flux pen was filled and capped at sea level. When this pen made it to his work bench high in the mountains of Colorado there was a significant amount of pressure in that pen. The flux squirted out right into [Darrell]’s eye. Better get some Visine on that, man. [Russell] was watching TV last night and saw an interesting commercial. It’s a bunch of electronic components, then a nook color showing the front page of Make: Projects, an Arduino schematic, and finally a happy robot. Two observations: firstly, someone in media and advertising doesn’t think ‘hacking’ is WarGames stealing bank accounts. Secondly, an ad exec looked into current users. Here’s the official YouTube video of the commercial. In a world… where components aren’t soldered… one man… uses a soldering station. Adafruit linked to the most outrageous promo video ever. This Weller soldering station provides 240 watts, battles alongside Agamemnon at Troy, has rework tweezers, and travels to Italy to wage war against the Latins. [Chris] is currently developing a new paradigm for programming. 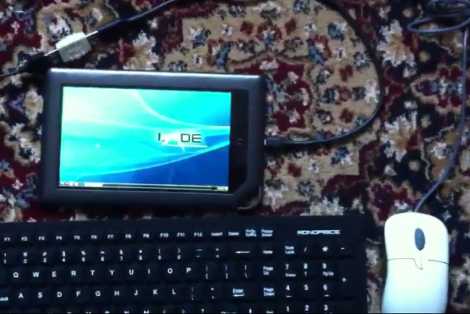 He calls it Light Table, and it’s designed to be an improvement over a simple text editor and project manager. All the documentation is at your fingertips, you can make changes on the fly. It reminds us of the zzstructure emulator we saw last year. It’s something to keep an eye on at least. XDA forum member [craigbru] wanted to beef up the audio setup in his Jeep, and thought that his Nook Color would make a suitable replacement. Since he jailbroke the e-reader, the head unit upgrade lets him do just about anything you can imagine, all from the comfort of the driver’s seat. Seeing that he would continue to go off-road with the Jeep, he wanted to construct a mounting solution that was convenient and sturdy – something we think he did very well. The dock was constructed using a Quadratec iVault stereo mount, along with a plastic tablet mount he had on hand. Because convenience was a primary goal, he put together a quick release charging solution as well as a simple audio interface using a set of touch contacts. 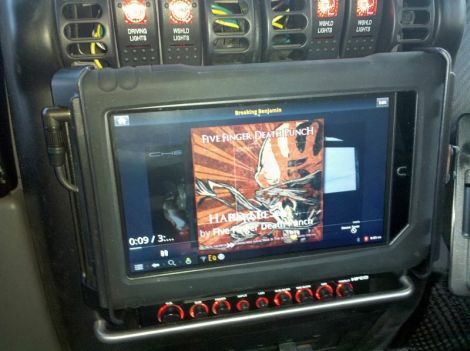 This allows him to connect and detach the tablet from the Jeep without having to fuss with a bunch of cables each time. He also added an audio equalizer along with a Bluetooth OBDII interface to the setup, allowing him to tweak his tunes and monitor his engine with ease. We think it’s a great-looking setup, and we’d be lying if we said we didn’t want one as well.